The global cosmetic packaging market is analysed by Transparency Market Research to find opportunities and analyse future trends. The report titled “Cosmetic Packaging Market: Global Industry Analysis, Opportunity Assessment, 2018 – 2026” states that the increased premiumization of cosmetic products and advancements in printing technology are propelling the growth of global cosmetic packaging market. The global cosmetic packaging market is expected to create an incremental $ opportunity of US$ 14,250.92 Mn during the forecast period. Cosmetic packaging is gaining market traction with remarkable growth throughout the forecast period primarily, due to an increase in demand from millennials in emerging markets such as India, Brazil, and South Africa. Global hair care & skin care industries are growing with higher annual growth rates. Anti-ageing products such as creams, shampoos, and hair conditioners are some of the prominent products driving the global cosmetic packaging market. Rising awareness of anti-aging products amongst the female population is one of the primary factor boosting the sales of the global cosmetic packaging market. E-commerce penetration into rural and urban areas is driving the global cosmetic industry sales, which, in turn, are driving the growth of the global cosmetic packaging market. Rising cross border sales and penetration of internet into emerging markets is expected to boost the sales of cosmetics. The increasing presence of millennials on social media helps them explore more global cosmetic brands which, in turn, is driving the sales of cosmetic packaging. For instance, Estee Lauder generated 12% revenue in the U.S., and 8% of its global sales were derived through e-Commerce retailing. Apart from Estee Lauder, L'Oreal also generated 25% of its revenue through E-Commerce retailing. The growing number of commercial setups is driving the global cosmetic packaging market. Factors such as changing lifestyles of the people, services provided by the beauty and wellness industry, increasing middle-class population of the Asia Pacific countries is expected to drive the growth of the global cosmetic packaging market. Moreover, the usage of color cosmetics in commercial establishments is comparatively higher than in households. This trend is expected to continue during the forecast period and is expected to drive the demand for cosmetic packaging. Improving economic conditions, coupled with the rising emphasis on grooming, in the emerging markets is the major driver influencing the demand for cosmetic packaging. Packaging printing technology is driving the global cosmetic packaging sales. Advanced and trending printing technologies such as hot stamp foil printing and flexography are helping cosmetic manufacturers to offer innovative and eye-catching packaging for their cosmetics. New advances in material and printing technology have opened up various design trends for cosmetic packaging. Manufacturers are using polypropylene films for premium cosmetic packaging where biaxially-oriented polypropylene (BOPP) are preferred as packaging material for cosmetics. 3D printing technology is the new trend being adopted by the cosmetic packaging manufacturers globally. 3D printing gives an aesthetic look to the product, and is generally used to package cosmetics, fragrances, and shampoos. In the global cosmetic packaging market report, key players from different geographical regions with research and development, high production, and supply channel facility are profiled. Company overview, strategies to compete in the market, product lines, company revenue, and segmental share of key players in the cosmetic packaging market are evaluated in the competitive landscape. Key manufacturers operating in the global cosmetic packaging market include Aptar Group, Inc, RPC Group Plc, Gerresheimer AG, Amcor Limited, Libo Cosmetics Company, Ltd., Quadpack Industries, HCP Packaging, Fusion Packaging, ABC Packaging Ltd., Swallowfield Plc, Saverglass sas, Essel Propack Ltd, Albea S.A., Quadpack Ltd, Coverpla S.A., The Packaging Company, Smurfit Kappa Group PLC, Alovey Cosmetic Packaging Co., Ltd, HCT Group, and Rise Cosmetic Packaging Co., Ltd. In Transparency Market Research’s global cosmetic packaging market report, we have analysed the strategies of key players. A competition dashboard of significant key players is provided in the global cosmetic packaging market report. Tier structure analysis of the cosmetic packaging market provides the contribution in the global market revenue of market players distributed among three tiers. In February 2016, the company acquired Megaplast GmbH, Megaplast France s.a.r.l. and Mega Pumps L.P. from Megaplast Group. The objective of the acquisitions is to manufacture all-plastic airless dispensing systems for beauty care. In January 2017, the company was recognized with WorldStar Packaging Award for its innovative inverted Daisy Squeeze Sour Cream packaging. In March 2018, RPC Group PLC acquired German packaging peer Nordfolien GmBH for EUR 75 million. Nordfolien operates from two sites in Germany and Poland which also include in-house recycling capabilities. In February 2017, the company acquired Promens AS, an Icelandic company providing rigid plastic solutions for personal, healthcare, and food markets. In this report, Transparency Market Research offers an 8-year forecast for the global cosmetic packaging market between 2018 and 2026. In terms of value, the global cosmetic packaging market is expected to expand at a CAGR of 4.7% during 2018-2026. The study reveals the cosmetic packaging market dynamics in five geographic segments along with a market analysis for the current market environment and future scenario over the forecast period of the market. The market report begins with historical trends, imports, exports, and cosmetic packaging industry outlook. It also includes the global value and volume for the duration 2018-2026. The Y-o-Y growth is also provided for a better understanding of the market, which is further explained by the graphical representation of the global cosmetic packaging market. It is followed by market dynamics and an overview of market, which includes TMR analysis of market drivers, restraints, opportunity analysis, and trends that are affecting the growth of the cosmetic packaging market. The global market for cosmetic packaging is further segmented as per material type, application type, container type, and capacity. On the basis of material type, the global market for cosmetic packaging is segmented into glass, paper, plastic, metal, and others (ceramic). The plastic segment is further sub-segmented into polyethylene (PE), polypropylene (PP), and polyethylene terephthalate (PET). On the basis of application type, the global cosmetic packaging is segmented into skin care, hair care, make up, and nail care. On the basis of container type, the global cosmetic packaging market is segmented into jars, tubes, bottles, pumps & dispensers, sachets, and others. On the basis of capacity, the global cosmetic packaging market is segmented into < 50 ml, 50 ml–100 ml, 100 ml-150 ml, 150 ml–200 ml, and > 200 ml. The next section of the report highlights the USPs of cosmetic packaging and provides information about raw material manufacturers, cosmetic packaging manufacturers, distributors, and suppliers in the market. Each section in the value chain includes some of the listed examples for a better understanding of the whole supply chain along with a profitability margin validated by the primary interviews taken by Transparency Market Research. 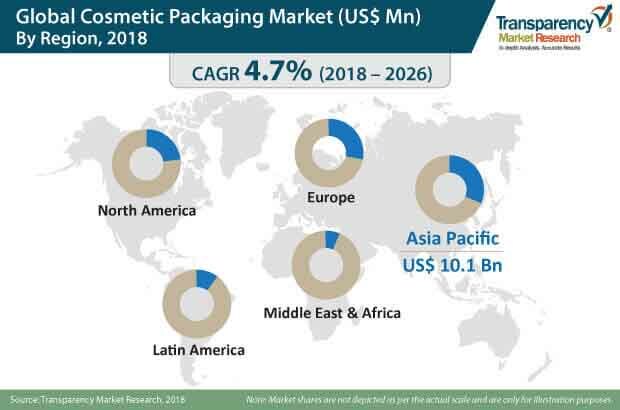 This point includes information about key players in the Cosmetic packaging market, along with their presence in North America, Latin America, Europe, the Asia Pacific, and Middle East & Africa. A pricing analysis is provided in the report in accordance with different regions and capacity-type segments. The prices for all capacity type segments in all regions including North America, Latin America, MEA, APAC, and Europe are provided. The USPs of the report also include a parent/associated market outlook, which is analyzed by Transparency Market Research. The next section of the report highlights the cosmetic packaging market, by region, and provides the market outlook for 2018–2026. The study investigates the Y-o-Y growth regionally, as well as analyses the drivers that influence the regional cosmetic packaging market. Main regions assessed in this report include North America, Latin America, Europe, the Asia Pacific, and the Middle East & Africa (MEA). The report (global cosmetic packaging market) evaluates the present scenario and growth prospects of the regional cosmetic packaging market for 2018–2026. To ascertain the cosmetic packaging market size in terms of value and volume, the revenue generated by key manufacturers and their respective production capacity is taken into consideration. The forecast presented here assesses the total revenue generated by value, across the cosmetic packaging market. In order to provide an accurate forecast of the cosmetic packaging market, we initiated by sizing up the current market, which forms the basis of how the cosmetic packaging market is expected to develop in the future. In the final section of the report on the cosmetic packaging market, a ‘dashboard view’ of the companies is provided, to compare the current industrial scenario and its contribution to the total cosmetic packaging market. Moreover, it is primarily designed to provide clients with an objective and detailed comparative assessment of key providers in the cosmetic packaging market specific to a market segment. Report audiences can gain segment-specific manufacturer insights to identify and evaluate key competitors based on an in-depth assessment of their capabilities and success in the cosmetic packaging marketplace. Company profiles are included in the global cosmetic packaging market report to evaluate their strategies, key product offerings, and recent developments. Key players operating in the global cosmetic packaging market are Aptar Group, Inc., RPC Group Plc, Gerresheimer AG, Amcor Limited, Libo Cosmetics Company, Ltd., Quadpack Industries, Fusion Packaging, HCP Packaging, ABC Packaging Ltd., Swallowfield Plc, Saverglass sas, Essel Propack Ltd., Albea S.A., Quadpack Ltd, Coverpla S.A., The Packaging Company, Smurfit Kappa Group PLC, Alovey Cosmetic Packaging Co. Ltd., HCT Group, and Rise Cosmetic Packaging Co., Ltd.